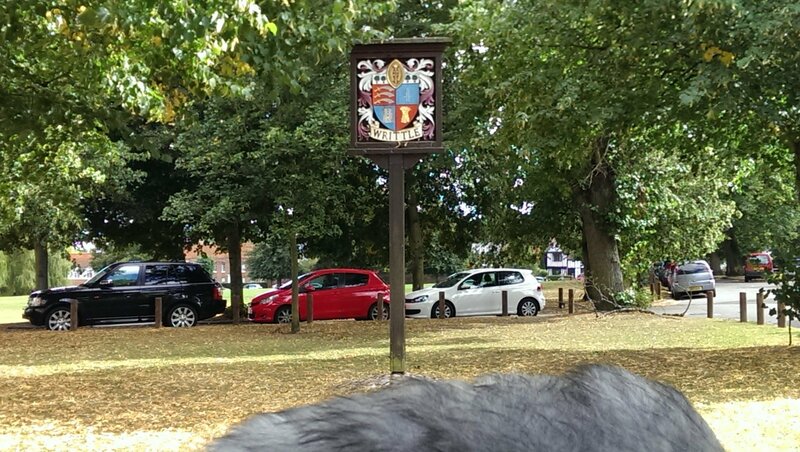 Writtle sign on The Green. Several recordings made in response to members of the public who stated that music from the V Festival held at Hylands Park, Chelmsford drifts across into Writtle during the event. I met up with Chelmsford resident and writer Chris Mathews who knew his way around the streets of Writtle and could also hear the sound of the festival from his back garden. We recorded in several locations, including the peaceful All Saints churchyard (where a lady was walking her dog), the pedestrian subway under the A414 Greenbury Way which was full of tunes and revellers, St. John’s Green residential street (with suspicious young man) and The Green next to the Rose and Crown public house, where the photo was taken. Naturally, there are varying degrees of sound drifting on the wind (which was a south-easterly), as well as the usual sounds of traffic and local residents going about their business amid the influx of yellow traffic bollards.